I wasn’t prepared for the beauty of the Kaiserliche Schatzkammer, or Imperial Treasury, in Vienna. It’s stunning! 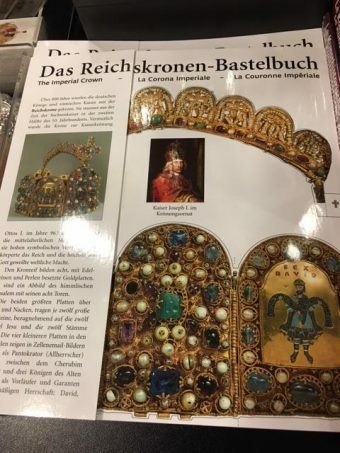 After our visit I bought a guidebook in the Treasury shop: Masterpieces of the Imperial Secular Treasury, Vienna (ed. Sabina Haag) and revisited the items in my head. I regretted not having hired an audio guide for an extra 4 euros – instead we’d relied on the inscriptions provided next to each precious object. Entrance to the collection is via the Schweizerhof of the Hofburg Palace and costs 12 Euros for an adult. Children go free. You need 1 or 2 hours to tour the 21 rooms housing this huge collection, depending on how absorbed you get. When you’ve finished you might want to relax in the famous Cafe Central. The crowns, gowns and jewellery on display cover the Middle Ages in Europe – roughly the years 500 to 1500. A bit of historical background: Charlemagne was crowned first Emperor of the Holy Roman Empire on Christmas Day in the year 800. The aim was to create a western empire closely tied to the Pope. People believed that the emperor had been chosen by God to represent Him on earth. The rise of the House of Hapsburg began in 1273, when Rudolf Count of Hapsburg was elected King of the Holy Roman Empire. From 1438 the Hapsburgs were the sole rulers of the Holy Roman Empire. Their rise culminated in the coronation of the first Hapsburg Austrian Emperor, Francis II in 1804. The Hapsburg Empire lasted until 1918. Medieval artists were fascinated by colour, and to them gold symbolized God’s light. If you visit the Hapsburg collection, prepare to be dazzled by their obvious political power, religious faith and love of art. 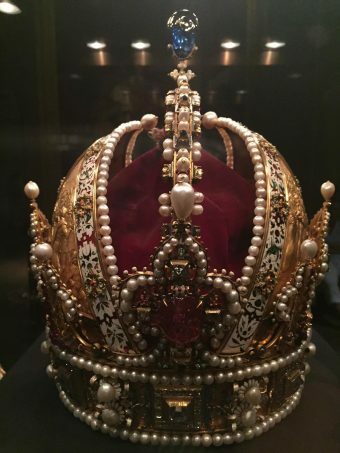 The Vienna Imperial Treasury is the only preserved collection of medieval crown jewels in the world. Originally the imperial regalia would have travelled with the emperor on his journeys around his vast empire. When I read about this an image came into my head from the past – from one of my daughter’s picture books. 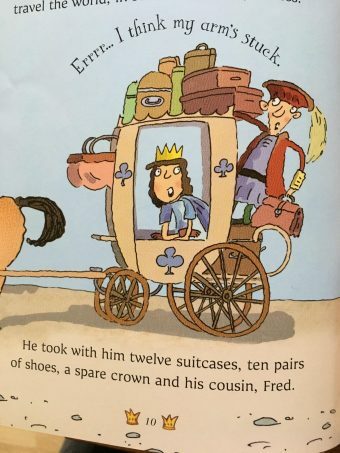 It turned out to be this one, from The Princess and the Pea in the Usborne Illustrated Stories for Girls. The story is retold by Susanna Davidson and illustrated by Mike Gordon. When the imperial regalia wasn’t en route somewhere it was kept in various castles and fortresses for safety. From 1424 onwards it was kept in Nuremburg. In 1800, with the growing political unrest in Europe after the French Revolution, it was taken to Vienna. Following the Anschluss of Austria in 1938 the Nazis took the collection back to Nuremberg. It was returned to Vienna by US forces after the end of the war. I saw a few 8 or 9 year-old children at the exhibition and noticed that one mum had put her son in charge of the camera. 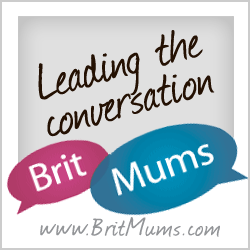 This is a really good way of involving children. He was trying to get the best angle for a photo of one of the crowns. Exhibitions are sometimes tricky with younger kids because there’s no “hands on” or multisensory experience; they can only look. I took my daughter to the National Gallery, London when she was 4. We turned it into an adventure. She enjoyed looking at the website at home, choosing a couple of paintings, finding out about them then going to the gallery to look for them. 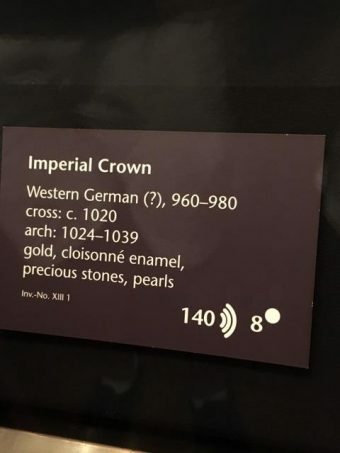 This could work well for a visit to the Vienna Treasury, to look for works of art and to identify precious stones and materials. 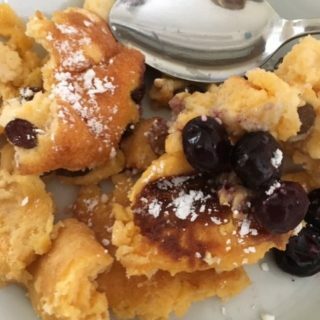 You could use the photos on this blog post to spark their interest before going. You just need to be aware that if you go there with younger children the visit might have to be short. I’ve picked out 10 of my favourite works of art from the Treasury and put them in chronological order of estimated date. 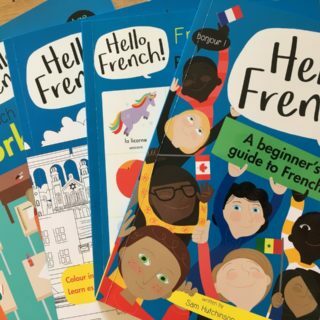 I’ve included the details which stood out for me, some of which will interest visiting children. This bowl shows amazing craftsmanship. It’s made from a single agate stone, harder than steel. How did they do this? It’s the largest known bowl carved into a single block of a stone. There’s a pattern in the stone which can be read as the “word” XRISTO, but that depends on the lighting. Because the word was hard to spot, people assumed it was only visible to the “chosen ones”. 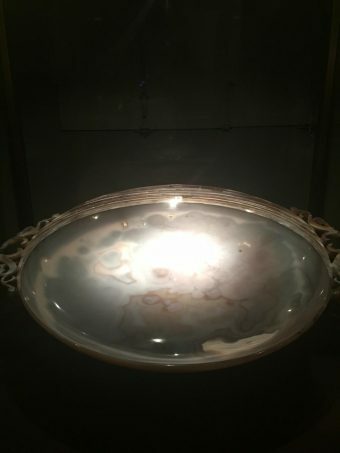 This idea led to the belief that the bowl had a direct connection to Christ. So they thought it was the legendary Holy Grail, the vessel which collected Christ’s blood as He hung on the cross. The Holy Grail was a central subject in medieval literature. It was said to be a miraculous spiritual vessel guarded by knights in a remote castle, waiting for a pure hero to find it. It would bring happiness and eternal youth to its owner. 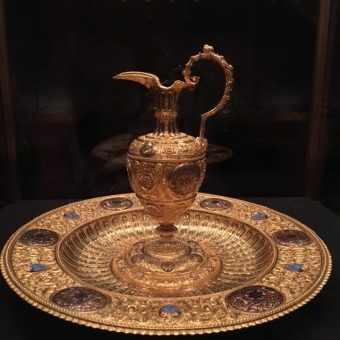 Together with the “unicorn horn” (narwhal tusk) in the collection, the bowl was considered too precious for any single member of the Habsburgs to possess – in case they were tempted to sell it. By special legal contract, the bowl had to remain in the family permanently. 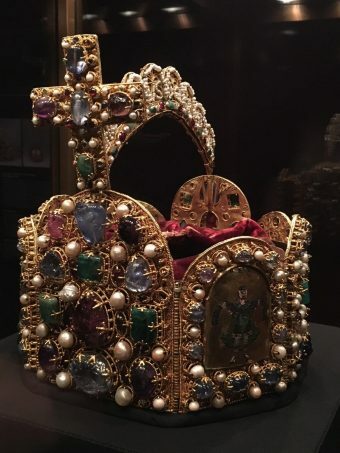 This spectacular crown was probably made for the coronation of Otto 1 the Great in 962, and then passed on to every new ruler until the collapse of the Hapsburg empire after WW1. The emperors of the Holy Roman Empire were appointed in Aachen and crowned in Frankfurt. From 1424 onwards the crown was kept in Nuremberg and used only for coronations. For me, it’s the highlight of the collection, because of its beauty and its history. 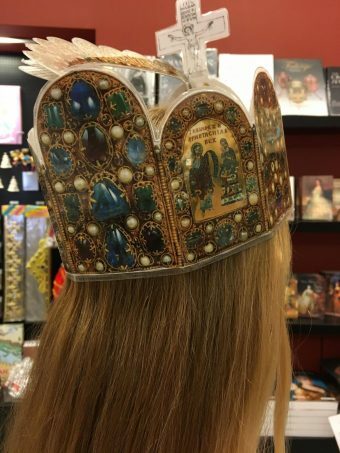 I remember sitting in lectures about the Holy Roman Empire at uni, and now I can’t get over seeing their actual real crown! It’s made up of eight hinged plates, eight being a traditional imperial number and thought to be a symbol of perfection. The rich decoration of precious stones and pearls glorify Jerusalem as a golden city, walls inlaid with precious stones. There are enameled images of Old Testament figures, with quotations. An image of Christ on a throne flanked by angels presents Him as the ultimate ruler of the world. He’s represented on earth by the wearer – the emperor. The arch imitates the helmet decoration of ancient Roman emperors. The bejeweled cross is a sign that this is an imperial power in Christ’s name. Its reverse shows Christ suffering, but with His eyes open – a sign of His triumph over death. 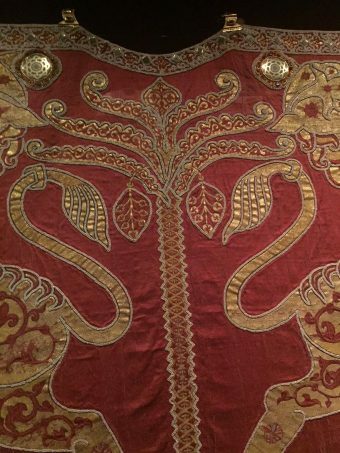 This is a red silk mantle decorated with elaborate gold embroidery and stylized animals such as lions, a camel, and a hare. There must have been an incredible amount of work involved in this. Last winter I went to the English Medieval Embroidery exhibition at the Victoria and Albert Museum, and there was a panel showing the intricate embroidery technique. 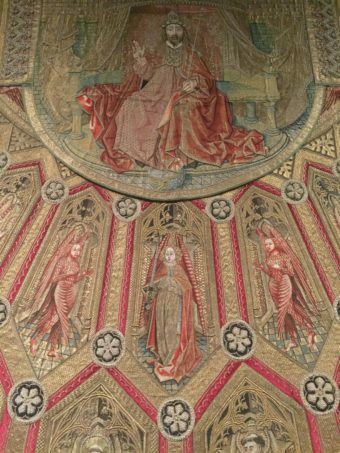 The embroiderers must have needed patience and amazing artistic skill – to say nothing of perfect eyesight. The mantle is thought to have originally been part of the Norman Kings’ treasure. 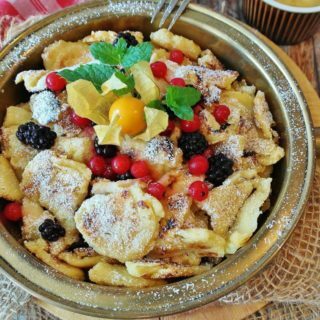 It was then inherited by the House of Hohenstaufen. With the coronation of Emperor Friedrich II in Rome in 1220 it became part of the imperial treasure. 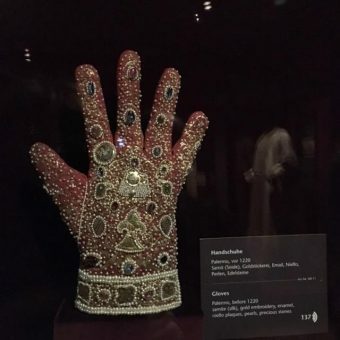 These gloves were made for the coronation of Frederick II in 1220. Their rich decoration incorporates birds and angels. Imagine wearing gloves like these – you wouldn’t dare to touch anything. Pluvials were splendid articles of clothing made for priests. This cloak fastened with a clasp across the chest. The overall theme is the magnificence of God and He’s pictured on a throne, surrounded by apostles, prophets, angels and other religious figures. This set is made from 10.5 kg of gold, not yet hallmarked in those days. Originally it was a wedding present for a couple in the family. It wasn’t intended to be used for baptisms: it has no religious decoration. Instead it was meant to be used for hand washing at the dining table. The imperial family used it for baptisms right until the collapse of the empire after WWI. Because it was in constant use it was spared the fate of many gold objects: they were melted down when money was short. Rudolf had this made as his private crown. The original imperial crown was only used for coronations, so he needed something to wear for other public appearances. Other rulers had private crowns made but this is the only one which survived. From 1804 (the first Hapsburg emperor) onwards it was used as the official crown of the Austrian empire but it was never actually used for coronations. The crown is decorative and symbolic. It has eight diamonds; eight is a number associated with the Hapsburgs and the original Imperial Crown has eight plates. The rubies represent the wisdom and fire of the Holy Spirit. The large sapphire on top of the crown is the colour of the sky and stands for heavenly Jerusalem. According to tradition, Napoleon Bonaparte’s son and heir was given the title King of Rome. There was great celebration when he was born. This ceremonial cradle was a gift to him from the people of Paris – he had a wooden one for everyday use. It’s made from 280 kg of silver to emphasize his wealth and national importance, and there’s symbolism in every detail. Napoleon’s emblem was the bee, so this explains the rows of bees on the sides of the cradle. At the foot of the cradle an eaglet is perched ready to fly up to a star from Napoleon’s monogram, standing out from a wreath of stars. The wreath is supported by what looks like an angel at the back of the cradle – it’s the personification of glory and victory. 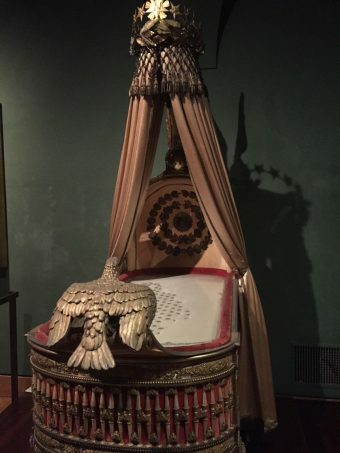 When Napoleon fell from power in 1814, his wife Marie Louise brought the cradle to Vienna. Napoleon married the eldest daughter of his opponent Holy Roman Emperor Francis II, to keep the political peace. She became the mother of his heir, the King of Rome, for whom the above cradle was made. Here she’s painted in her wedding dress, with a red velvet cloak with ermine lining. She’s wearing a diadem and necklace of diamonds and rubies. 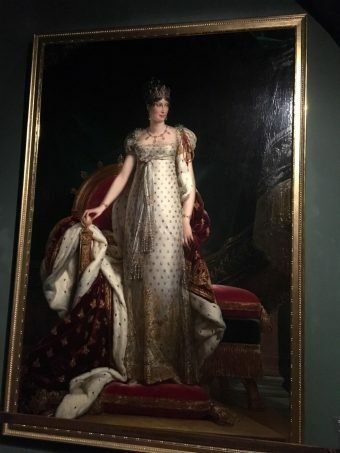 A diamond-set portrait of Napoleon is hanging from her necklace. You can really see the textures of the fabrics. 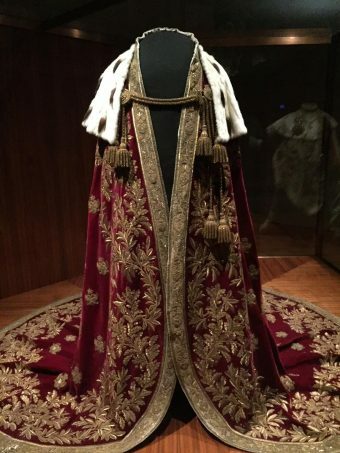 This mantle was made for the Austrian Emperor to wear when Ferdinand I was crowned King of Hungary in 1830. The amount of intricate work is phenomenal. I wonder how much notice they were given of the coronation and how many craftspeople had to work on the mantle! Amid the patterns of gold thread embroidery, leaves and fruit, you can see eagles, each holding a sword and wearing the crown of Rudolf II. Their chests are decorated with the Austrian flag. One more fascinating item is a walnut cabinet made in Vienna in 1895. Its small compartments contain keys to the coffins of 139 Hapsburgs from the 17th century onwards. The middle ones were for the emperors and their closest relatives. The coffins are resting in various crypts throughout the former Austrian Empire. The thought of the coffin keys really “creeps me out” (one of my daughter’s expressions). Perhaps that’s why I forgot to take a photo of it. For me it brings back memories of late-night scary films on TV with titles like “The Oblong Box”. My Dad used to watch these films and maintain that they were “too silly to be frightening”. To finish, here’s our daughter wearing the Imperial Crown of the Holy Roman Empire! It’s a push-out one from a lovely “Bastelbuch” (craft book) you can buy in the shop.